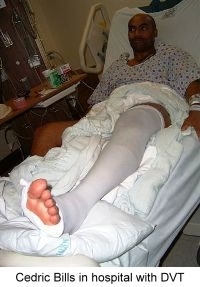 I was way too young for this to happen, but in August of 2002 when I was 37 years old I was struck with blood clots. It all started one Monday morning after I had done some extensive car traveling over the weekend. I woke that morning and noticed I had a pain in my left calf when I stood up. I have had pains like this before but they always just turned out to be muscle aches. You see, I should also mention that when this happened I was an army officer and master fitness trainer so muscle aches were just a part of the territory. My mother and sister were visiting me, and we had a nice family trip planned for Virginia just five days away on Friday. I went on with my day as an instructor as usual. I made it through the day and woke up the next day, Tuesday with the pain worse. I massaged my calf to get some relief and remember telling my mother about the ache. It was another busy instructor day, and I massaged my calf again throughout the day and that night before going to sleep. On Wednesday morning, the minute my feet hit the floor I noticed that the pain was much worse now, and I had to limp when I walked. I tried to make an appointment with the doctor but at the time they had available for me, I was scheduled to be on the platform to teach students, and I was the only one available to teach this block of instruction. We have a saying in the army, "Mission first, soldiers always" and that meant that the doctor would have to wait. In addition to the increased pain, I noticed I was short of breath after walking through the halls or up the stairs at work. I specifically remember taking out the trash that evening and coming back into my apartment breathing heavy and telling my mother and sister that I really needed to get back to running more because I was out of shape...if I only had known the signs! Thursday morning the pain was worse still but this was my week to teach the students my area of expertise, and I didn't want to pass the buck, so I did not even consider calling to schedule an appointment for the doctor then. Any exertion of physical activity brought heavy breathing or shortness of breath, so I told myself that next week I would boost my cardio to get in better shape. When Friday morning came, I could have used crutches but I was not about to call and schedule a doctor's appointment because I knew this was the last day of instruction and we would be able to leave early for the weekend from work so I could take my mother and sister on the trip to Virginia. I did not want to ruin the trip and just said I would see a doctor first thing Monday morning. I started out the trip by sitting in the backseat with my leg elevated and then two hours from our destination we made a stop for gas. I was wearing shorts and it was there when I was standing in line to buy a snack that I decided to look down at my calf because of the pain to see if I could notice anything. This was the first time I noticed how much bigger my calf had gotten, and then I started to worry and told my mother that when we got to Virginia I should go to the emergency room. My mother, who had worked as a nurse's assistant, looked at my calf and said she thought it could be a blood clot. We arrived at my friend's house in Fredericksburg, VA around midnight and after we got my mother and sister situated we headed off to Fort Belvoir and the emergency room. There, after several hours of waiting and blood samples the doctor suspected I might be suffering from DVT. The course of action was to have me transported to Walter Reed Army Medical Center by ambulance because they were not equipped to deal with something like this. I arrived and was admitted to the hospital at around 6 AM and saw my team of doctors for the first time shortly thereafter. I don't like hospitals and wanted to know if it were possible that I could be released that day or the next because I didn't want to spoil the trip. The doctor told me if I could learn to give myself injections of Lovenox in my abdomen that I could possibly be released, but they wanted to send me for a lung cat scan to see if there was anything to my shortness of breath. When my team of doctors returned with the results later that morning, I was told that leaving the hospital was out of the question because in addition to DVT in my leg the clots had traveled into both of my lungs, which is called pulmonary embolism or PE and can be fatal. That was my first episode with DVT/PE, but it would not be my last. When you have had one blood clot, you may be at an increased risk of having another, but they can still be prevented. 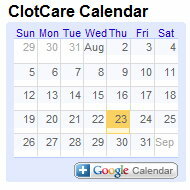 My second blood clot would happen six months later in April. I had to get off of my anticoagulant so that I could be transferred to Korea for my next assignment. While on the drugs for DVT, you are non-deployable and cannot be stationed in Korea, so I asked my doctor if I could come off of the medication. He told me to stop taking the medicine, and then we would do a blood work up to see if I was okay. This was April 1st of 2003 and all systems were go, so I could proceed with my assignment and stay in the army with my 19 years of service. I really wanted to get my 20 years, and this last tour would do it. On 15 April 2003, I stood up from my desk before leaving from work at the end of the day and I noticed a familiar pain. I went home and really looked hard in the mirror to check for swelling. I did notice some and was not about to wait like I did the last time, so the next morning I made an appointment with the doctor but it wasn't until 11:00 AM. I went to work and was to start a class that I needed for my next assignment. By 9:30 AM, I had to have another instructor rush me the emergency room because my calf had gotten so big that I had to remove my boot. It turned out that I was right, and I had my second clot in the same leg. Now I would be on the anticoagulation medication for life and was treated and sent home for about two weeks of convalescent leave. I was taken off the assignment for Korea and months later I would be reassigned to Hawaii near the second largest army hospital in the world, Tripler AMC. I was fine for a long time while on my medication, but in December of 2003 I started to go through a medical evaluation board to see if the army would medically retire me or let me stay in and serve. This process took about a year, but the findings were that I was unfit for further military service but would get zero percent disability because I was fine as long as I was on my medication. My results came back in December of 2004, and I was given a retirement date of 17 March 2005. On December 10, 2004 I went to Maui and was trying to body surf with a friend and had a wave pick me up and throw me around like a limp rag. I started having headaches that day 24/7 and went to the emergency room on the 23rd of December to see what was going on. A cat scan didn't reveal that there was a problem. I was given some narcotics for the pain and told to follow up with my doctor in a week if it was not better. At an appointment a week later with my doctor, I was given medication for migraine headaches to see if that would help. I still had my headache 24/7 and it was getting worse. The night before I went back to the emergency room on January 5, 2005 I had to sleep in a sitting position to avoid putting too much pressure on my head because even a pillow hurt. The emergency room visit and a cat scan revealed that I had a bleed on the brain, a subdural hematoma. I was given two options from my neurologist of either having brain surgery or letting the bleed resolve on its own. In either case, I would have to stop my medicine because it increases bleeding risk. I chose not to have the surgery and was taken off my medication, but because I was at high risk to develop another blood clot in my leg, there was a filter placed in my chest to prevent a potential clot from traveling to my lungs. I was released on 10 January, 2005 with strict instructions to relax and take it easy to avoid getting that next clot. At this point it was just a matter of time, so I waited until 4 February, 2005 when I stood up from my table at home and felt the familiar pain once again. I immediately noticed the swelling and went to the emergency room that night. Because of my bleed on the brain, the ER doctor said there was nothing he could do but give me pain medication and sent me home. The next morning when I awoke my left leg was so severely swollen that I knew I had to return to the ER and could barely walk. While I waited on a bed in the ER my leg continued to swell, and then my foot became purple in color so they were concerned that I might loose my foot if something wasn't done soon. We were waiting on the vascular surgeon to get out of surgery to get his opinion. He finally appeared after hours and was able to get a pulse in my left foot with a special instrument, and then I was admitted to the hospital once again to wait and see what my team of doctors would try to do. I was told by all of the doctors that I was between a rock and a hard place because they had to wait until the bleed on the brain was completely healed before they could treat my new clot at all. The power of prayer is amazing and the next day the test revealed they could start giving me medicine to treat my latest clot, but there had been a lot of damage to my leg and it was extremely large. I would not get out of that bed and walk again for the next 20 days and would contract a blood infection, have a seizure, and have a blood clot form on my arm and also have clots go into both lungs again for my second bilateral pulmonary emboli. I was not expected to survive. After I got out of the hospital barely able to walk, I had to recover by lying around a lot with my leg elevated to try and reduce the swelling. Then one day I saw the "Today" show and Melanie Bloom was on there talking about her husband David who had died and how she had joined the Coalition to Prevent DVT to help bring awareness to this silent killer. She gave a website and encouraged everyone to submit their story if they had an experience with DVT. I submitted my story and was contacted several months later and asked to be interviewed to get my story on film. That was the beginning that would lead me to become a patient spokesperson for the coalition, speak at other events, and then do the public service announcement for 2006. After my release from the hospital in February of 2005, I was extended on active duty service to rejudicate my medical evaluation board. After a move to FT Gordon, GA to be near my children for support I was finally given a new retirement date of 13 March 2006, but this time I was given 60% disability by the army. March has been declared national DVT Awareness Month, and it is my hope to spread the word and bring awareness to this silent killer by any means necessary. Thank you for allowing me to share this story with you. 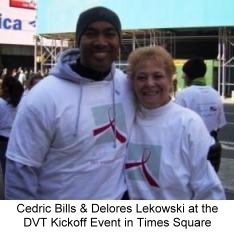 You may submit your story and find out other facts about DVT and PE by visiting the website of the Coalition to Prevent Deep-Vein Thrombosis at www.preventdvt.org. You can learn more about Cedric on his website at http://www.cedricbills.com/. Click here to read a transcript of CNN's Larry King Live show on which Cedric appeared, March 8, 2006.